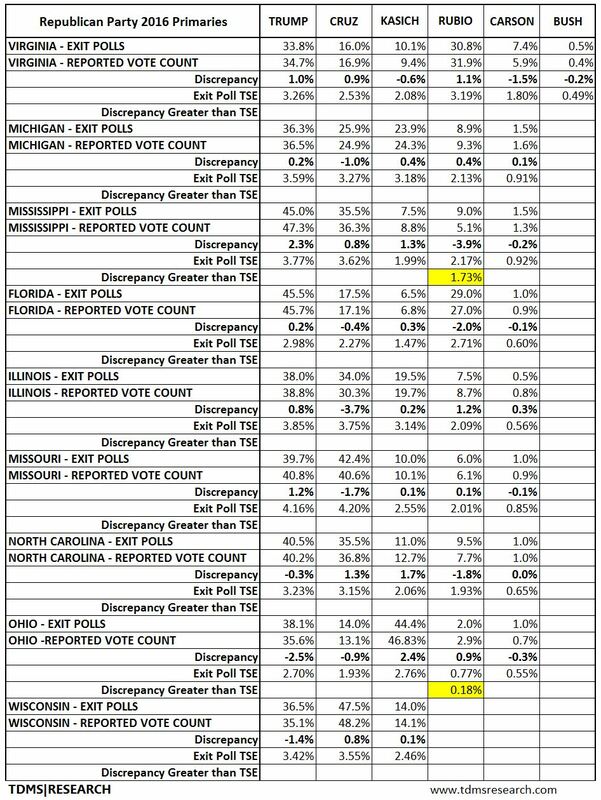 The following tables compare exit poll results with the unverified computer vote counts for all the primary states for the exception of New Hampshire and South Carolina. 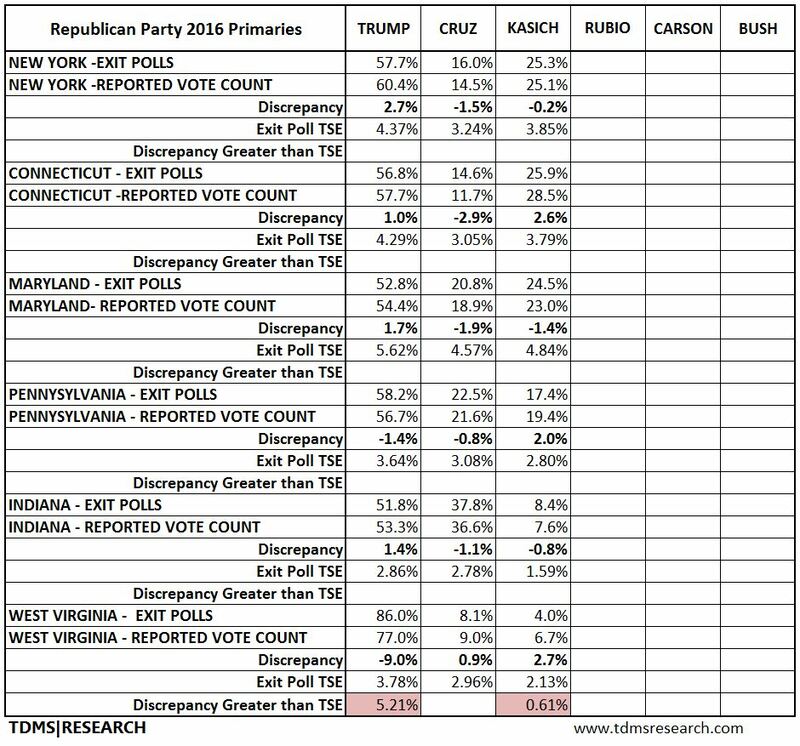 * The comparison of 106 individual exit polls results for the main candidates in the Republican Party primaries (Trump, Cruz, Kasich, Rubio, Carson, and Bush) with their actual vote totals allow for the calculation of the total survey error (TSE). As the completed exit polls are compared to the vote totals, the TSE measures all errors associated with an exit poll–sampling, coverage, nonresponse, measurement, and post-survey errors–and not just the sampling error associated with the standard margin of error. 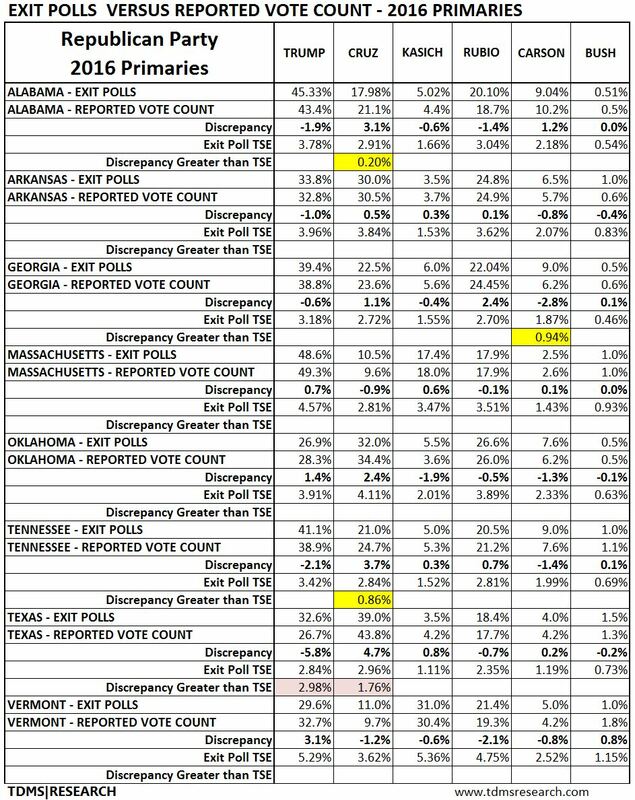 With the exception of the primaries in two states, West Virginia and Texas, with very large discrepancies (18% and 10.6% respectively) going against Trump, the exit polls for Republican Party primaries have been fairly accurate. By increasing the standard statistical margin of error (MOE) by 32%, and excluding the outliers in West Virginia and Texas, the percentage of exit polls exceeding this increased MOE goes down to 4.76% (5 of 106) which is just under the expected 5% in an exit poll with a confidence interval of 95%. The TSE used below takes into account the total survey error by increasing the MOE by 32%. Where the discrepancies between the exit polls and the computer vote counts exceed the TSE, these cells are colored in yellow. The results of West Virginia and Texas, excluded from the TSE calculations, are colored in red. * The capture of exit polls only began after the SC primary. 5 Comments on "Republican Party Detailed Tables. TSE of the 2016 Primaries"